With Saturday's win Memphis swept the season series with the Cardinals. MEMPHIS, Tenn. — The Memphis Tigers found a way to quiet a bunch of hometown critics with coach Josh Pastner’s biggest win yet. Rick Pitino and his seventh-ranked Louisville Cardinals are kicking themselves for blowing a game they thought they had won. Chris Crawford hit a 3-pointer with 1:36 left to put Memphis ahead to stay, and the 21st-ranked Tigers beat Louisville 72-66 Saturday, sweeping the season series from the Cardinals. The Tigers were coming off a loss at Houston on Thursday night that had them eager to hit the court about 40 hours later. Memphis (22-7, 11-5 American Athletic Conference) trailed 65-57 with 4:45 left when Michael Dixon Jr. scored six straight, jumpstarting the Tigers who scored 15 of the final 16 points. ”We made the last run,” Crawford said. Louisville (24-5, 13-3) snapped a seven-game winning streak by going cold after taking its biggest lead of the game. The Cardinals scored only on a Chris Jones hit a free throw with 40.3 seconds to go. With No. 11 Cincinnati losing at UConn earlier Saturday, the Cardinals had the chance to move atop the league standings with only two games left with a win. Pitino was not happy at the missed opportunity. Montrezl Harrell scored a career-high 25 points and grabbed 12 rebounds for Louisville. Russ Smith scored 15 of his 19 points in the first half and fouled out in the final minute. Luke Hancock had 11. Dixon finished with 18 for Memphis, which hadn’t swept Louisville since 1996-97 when both were in Conference USA. 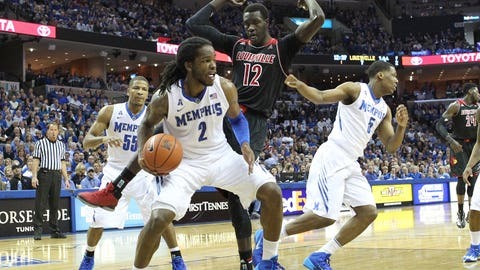 Louisville also had won the last three in Memphis. Geron Johnson scored 15 points. Austin Nichols added 14, and Crawford finished with 12 points, going 4 for 5 from beyond the arc. Dixon made four straight free throws starting with 4:23 left and added a layup. Pitino put Smith back in the game with four fouls, but Johnson stole the ball from the senior guard late in the shot clock and scored a layup with 2:35 left tying the game. Crawford’s fourth 3 from the top of the key put the Tigers ahead to stay. Memphis scored 12 straight points before Jones’ free throw. This game was scrappy from the start before a sold-out crowd at the FedExForum as part of a doubleheader with the Cleveland Cavaliers and Grizzlies on Saturday night. The 18,375 fans were fired up for the Tigers’ lone shot in Memphis against Louisville as conference foes, reviving a rivalry that started back to the old Metro Conference. The Cardinals are moving to the Atlantic Coast Conference next season. The Tigers jumped out scoring the first six points and were up 37-31 at halftime. ”It was literally six on five again because of the fan base, because the fans were so loud,” Pastner said. Louisville opened the second half outscoring the Tigers 13-4, and the Cardinals used a six-point spurt to take their first lead of the game. Harrell scored on a layup, and then Jones – a Memphis native – hit a jumper with 16:14 remaining for Louisville’s first lead at 42-41. Memphis pulled within 59-57 on a 3-pointer by Crawford from the left corner in front of the Tigers’ bench with 6:35 left. But senior David Pellom was called for a flagrant 1 for an elbow to Stephan Van Treese under the basket. He hit both free throws starting a 6-0 spurt that Harrell capped with a dunk with 4:45 left, giving Louisville its biggest lead.